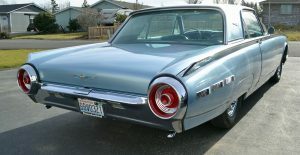 This is a nicely restored 1962 Thunderbird that we just bought. 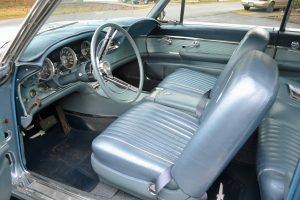 It has had a complete rebuild, with a rebuilt engine, transmission, front end, new shocks all around, new radiator and heater core, with all new brakes and brake lines. 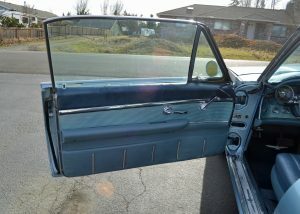 The paint is very nice Acapulco Blue, with blue leather interior, as the car was originally made. 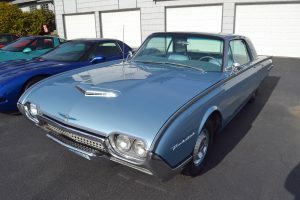 It is a very nice cruiser and shares garage space with Keith’s 3 Corvettes, which drive quite differently from the Thunderbird. 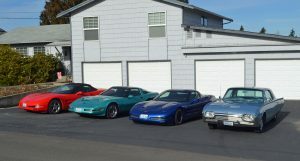 The three Corvettes all drive much differently from each other. The red 2000 convertible is a nice, refined cruiser. The blue 2002 Z06 is somewhat of a beast with a stiffer suspension, and 100 more HP, than the 2000. 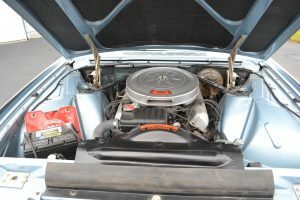 The 1991 turquoise is more like a high powered go kart, especially since it is supercharged. Below 4500 RPM it makes more power and torque than the 2002 Z06.